A V-twin engine, often just V-twin, is a two cylinder internal combustion engine where the cylinders are arranged in a V configuration. Harley-Davidson Road King 45° transversely mounted V-twin. Moto Guzzi Jackal with a longitudinally mounted 90° V-twin. Honda 90° transversely mounted V-twin. Ducati 90-degree transversely mounted V-twin. Honda GL500 Silver Wing with a longitudinally mounted V- twin. There is some ambiguity regarding what defines a V-twin. When the cylinders are arranged in a "V"-shaped pattern, it is generally accepted as being a V engine. However, some authors differentiate using "V-twin" to mean the classic V design of a shared crank pin for each pair of cylinders and "V-2" to indicate a crankshaft with a separate crank pin for each cylinder. This convention is not common, and applies only to two cylinder engines. For example, while most V8 engines use shared crank pins for cylinder pairs, they are not referred to as "V-octuplets". Most engine manufacturers use the classic shared crank pin design. Some notable exceptions include the Moto Guzzi 500cc with 120° V angle and 180° crank pin offset that Stanley Woods rode to win the 1935 Isle of Man Tourist Trophy; the 1983 Honda Shadow 750, claimed as being the first V-twin with an offset-dual-pin crankshaft; and the 1987 Suzuki VX 800, 45° V angle with 45° crank pin offset in USA and 75° crank pin offset for the rest of the world. Generally, any two-cylinder motorcycle engine with its two cylinders arranged more than 0° and less than 180° apart is referred to as a V-twin. 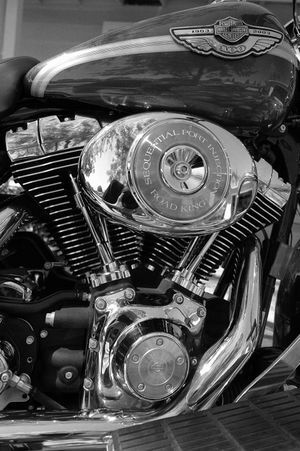 The V-twin engine is not designated by a specific angle, but is often associated with narrow V angles of 42° to 50° as the classic V-twin configuration. Any narrower could cause unwanted vibration, any wider and the chassis would have to be too long. A 90° twin engine, such as the signature Ducati engine — with the front cylinder approximately horizontal and the rear cylinder approximately vertical — is generally referred to by Ducati as a "L"-twin engine. There is no technical distinction between V-twin and L-Twin engines. These are merely names used by convention. When comparing common shared crank pin designs, the 90° V angle acts as a counterweight to provide primary balance to the engine, but the firing is uneven. Smaller angles give poorer mechanical balance, but more even firing for a four-stroke (but, even less even firing for a two-stroke). See external links for Shaking forces of twin engines by Vittore Cossalter. The terms longitudinal engine and transverse engine are most often used to refer to the crankshaft orientation, however, some sources, most prominently Moto Guzzi, use the terminology in the opposite way. A Moto Guzzi Technical Services representative tried to explain to LA Times columnist Susan Carpenter that Moto Guzzi engines are "called 'transverse' because the engine is mounted with the crankshaft oriented front to back instead of left to right." 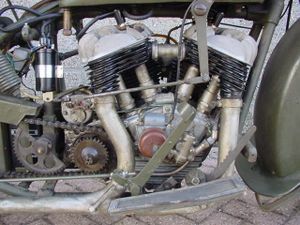 In spite of this, it it could be assumed that those who call V-twin motorcycle engines "transverse" when they are mounted with the crankshaft front-to-back and the cylinders sticking out the sides are saying that to them, the engine's axis is the line passing from one cylinder to the other, at a right angle to the crankshaft, rather than going by the crankshaft's axis. Highly technical sources, such as V. Cossleter's Motorcycle Dynamics, or Gaetaeno Cocco's Motorcycle Design and Technology are careful not simply to use the terms "longitudinal engine" or "transverse engine," but rather to specify that they mark the engine's orientation based on the crankshaft, and so they will say "transverse crankshaft engine" or "longitudinal crankshaft engine." The engine can be mounted in transverse crankshaft position as on Harley-Davidsons, Ducatis and many recent Japanese motorcycles. This transverse position gives the motorcycle a reduced frontal area. The main disadvantage of this configuration is that the rear cylinder and the front cylinder will receive different air-flows making air cooling somewhat problematic especially for the rear cylinder. Cooling problems are somewhat mitigated by having all "four" sides of each cylinder exposed to air flow. This differs from a parallel-twin cylinder engine which has a distinct front, back, and sides, but the inside of each cylinder is not exposed to airflow as the cylinders are typically joined together with a cam chain running up through the block in-between the cylinders. 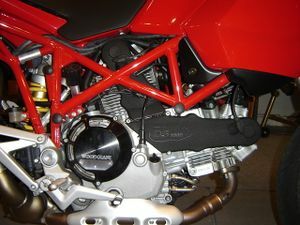 This air-cooled Ducati Monster 620 has a transverse crankshaft 90° V-twin with one cylinder laying horizontally, and one vertically, so that the rearward, vertical cylinder's air flow is less obstructed by the one in front. Honda's VTR250 is similar, but the engine is not leaning forward, thus each cylinder is about 45° from vertical. The rear cylinder's air flow is blocked, but note this is a water-cooled engine, so what most matters is that the radiator is out in front with good air flow. As the Ducati models get larger engines, they gain oil-, and then water-cooling, as in this Monster S4R S. Like the VTR250, the radiators are out in front, but the basic engine orientation retains the cooling advantages of the Monster 620. The longitudinal crankshaft two-cylinder V as seen on Moto-Guzzis and some Hondas is less common. This orientation is well suited for shaft drive by eliminating the need for a 90° bevel gear at the transmission end of the shaft. In motorcycles, a longitudinal engine fits well inside the frame, and aids cooling because both heads protrude out into the air. However this approach has the slight disadvantage in motorcycles of causing a torque reaction that tends to lean the motorcycle slightly to one side as the angular rate of the crankshaft increases or decreases. The faster the change, the larger the torque it produces. However, many motorcycle manufacturers have corrected for torque reaction by rotating the transmission input shafts and/or the balance and drive shafts opposite that of the crankshaft so that there is approximately equal mass turning clockwise and counterclockwise at any time, thereby physically canceling the effect. ↑ Honda: 1983 Shadow 750. Retrieved on 2008-05-20. ↑ "Suzuki VX800", Cycle World: 36-37, July 1990, "At some point in the motorcycle's development, the company changed the crankpin offset from 45 to 75 degrees in hope of creating a smoother-running motor. But just as production began, American Suzuki engineers decided that the new offset resulted is less mid-range power as well as a too-sanitized exhaust note, one that didn't sound very V-Twin-like. Presto, now the US models come with the 45-degree offset, while the rest of the world gets the 75-degree staggered crankpins." ↑ Clement Salvadori. 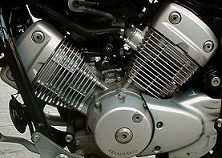 [http:, , www.americanrider.com, output.cfm?id=2242657 V-TWIN IMITATION and HISTORY]. Retrieved on 19 April 2010. ↑ [http:, , www.motomorini.com, web, #?id=motore& Motore]. Retrieved on 28 April 2010. ↑ 6.0 6.1 Cossalter, Vittore (2006). Motorcycle Dynamics (Second Edition ed.). Lulu.com. pp. 291–294. ISBN 978-1-4303-0861-4. ↑ Foale, Vittore (Tony). Motorcycle Handling and Chassis Design: the art and science (Second Edition ed.). Tony Foale. pp. 11–6. ISBN 978-8493328634. ↑ Carpenter, Susan, "Chaps aren't de rigueur, but a helmet, yes", ASK THROTTLE JOCKEY, http://www.latimes.com/classified/automotive/highway1/la-hyw-qa25jul25,1,2706840.story, "According to my source at Moto Guzzi Technical Services, "The Guzzi engine is a 90-degree 'L' twin, actually, because the cylinders are oriented at 90 degrees, instead of a typical V twin that has a smaller angle ( 60-degree, 77-degree, etc.). It is called 'transverse' because the engine is mounted with the crankshaft oriented front to back instead of left to right. Because of this you cannot run a chain or belt drive directly to the rear wheel like in most motorcycles. This is why you have a separate gearbox that bolts to the engine and transfers the power to the rear wheel via the drive shaft. This is how it is done on the Moto Guzzi and a BMW." ↑ 9.0 9.1 Coombs, Matthew; Haynes, John; Shoemark, Pete (2002), Motorcycle Basics (2nd ed. ), Haynes, p. 1•31, http://books.google.com/books?id=D0DhHAAACAAJ, "The transversely mounted [cylinder] V-twin, as used to good effect for many years by Moto Guzzi, slots easily into the frame, and has excellent cooling as both heads are stuck out into the wind. It also provides the perfect set-up for using shaft drive." ↑ Holmstrom, Darwin (2001), The Complete Idiot's Guide to Motorcycles, Alpha Books, ISBN 0028642589, 9780028642581, http://books.google.com/books?id=VGrp5Pjsf4UC&pg=PA82, "Ducati's engines, which are longitudinal (they are positioned lengthwise in the frame) most obviously display the "L" configuration, but Moto Guzzi's engines, which are transverse (arranged croswise in the frame), are also at 90 degrees." ↑ New 2009 Moto Guzzi V7 Classic Honors Historic Roots, Moto Guzzi Spa, http://www.motoguzzi-us.com/servonline/news/dettaglio.asp?indice=271, retrieved 2009-04-29, "Just as importantly, the V7 became an instant technology trendsetter thanks to its innovative transverse, air-cooled V-twin engine with shaft drive." ↑ New 2009 Moto Guzzi V7 Classic Honors Historic Roots, Moto Guzzi Spa, http://www.motoguzzi-us.com/servonline/news/dettaglio.asp?indice=271, retrieved 2009-04-29, "We could, of course write a book about Moto Guzzi’s transverse V-Twin." ↑ Breva V 1100, Moto Guzzi Spa, http://www.motoguzzi-us.com/Nuovi_modelli/breva1100/specifiche4.asp?pagina=spec&modello=breva1100&pag=4, retrieved 2009-04-29, "Just as importantly, the V7 became an instant technology trendsetter thanks to its innovative transverse, air-cooled V-twin engine with shaft drive." ↑ A walk around the Breva V 1100, Moto Guzzi Spa, http://www.motoguzzi-us.com/Nuovi_modelli/breva1100/specifiche4.asp?pagina=spec&modello=breva1100&pag=4, retrieved 2009-04-29, "The transverse 90° V-Twin engine and its shaft drive were chosen not as limitations on the freedom of design, but as the very heart of the design concept." ↑ Grubb, Jake (March 1975), "Easy Riders Grand Touring Motorcycles for '75 url=http://books.google.com/books?id=aeMDAAAAMBAJ&pg=PA82", Popular Mechanics (Hearst Magazines) 143 (3): 82, ISSN 0032-4558, "Ducati 750 Sport with its clip-on handlebars and racing setup, is for those who want to do their touring stretched out prone! Engine is a longitudinal V-twin. ..The unique 90∘longitudinal engine produces enormous low and mid-range torque...Moto Guzzi 850T...An 850-cc 90 V-twin engine..."
This page was last edited on 20 April 2019, at 18:48.